“We just have to drive to the end of the road,” replied Scott, after I’d asked him if he knew how to get to Teahupo’o, the first stop on our trip around French Polynesia. We’d just picked up our hire car, and with nothing but a dodgy map in one hand and a banana in the other, I wasn’t convinced it would be that easy. “Okay, then!” I said, looking forward to the moment when we’d realise we were lost and Scott would have to ask someone for directions while I sat smugly in the passenger seat. Alas, that moment never came, because it really WAS that simple. About an hour and a half’s drive south of the main city of Papeete, Teahupo’o is a charming little surfing village located quite literally at the end of the main road that circles the island of Tahiti. Around mid-August every year, the tiny township hosts the world-famous Billabong Pro Tahiti, attracting surfers from all over the world to ride one of the craziest reef breaks on the planet. It was a bit of a coincidence that we happened to be in Teahupo’o at the same time as this year’s Billabong Pro event. We’d already booked our flights and planned to spend our first weekend in French Polynesia exploring the area, and a few weeks before we left it was announced at the surfing competition would take place on the exact same dates we were going to be there – yay! Golden light shone naturally through the white mosquito net surrounding our bed in our little bungalow at Vanira Lodge. As I slowly woke, I heard the sounds of nature coming alive, greeting each other ‘Good Morning’ with chirps, clicks and buzzing. At least, I hope they were greeting each other good morning… for all I know, the birds could have been plotting with the geckos to catch the insects for breakfast. Either way, it was definitely time to get out of bed and start the day. Scott and I had a quick breakfast before making our way down to the point at the end of the road to get on one of the first boats out to the reef break, where Day 2 of the 2017 Billabong Pro Tahiti had just kicked off. The tiny village of Teahupo’o was buzzing with energy; full of surfers, families, travellers and locals, who had all come together to watch an international sporting competition on the black sand beaches of southern Tahiti. We jumped in a little speedboat, and as we jetted off over the bright blue lagoon on our way out to the channel, I could feel the excitement bubbling from deep within. 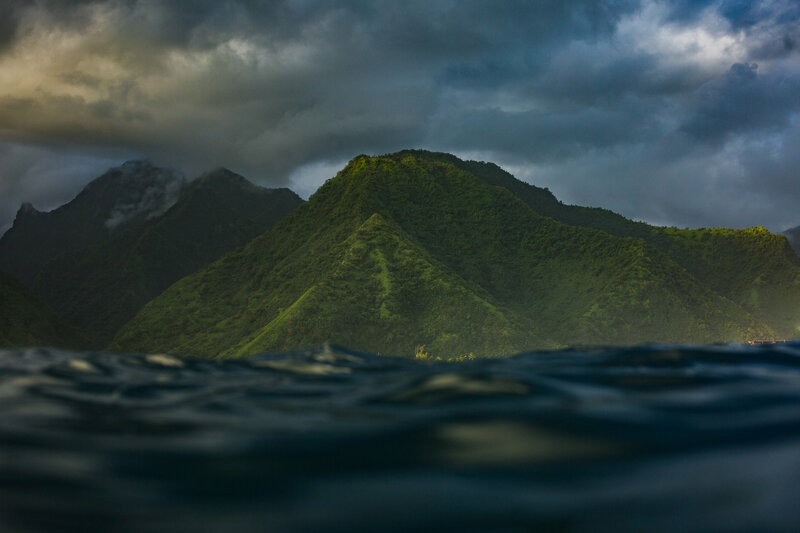 The view from the ocean looking back towards Tahiti was amazing; I watched in awe as I took in the magnificent sight of the jagged mountains in the centre of the island, surrounded by low lurking wispy clouds that gave off a Jurassic Park vibe. Would I be seeing dinosaurs on this trip? Potentially. As we danced across the lagoon en route to the channel, our speedboat slowed with the appearance of a massive pod of dolphins, who frolicked around us as we watched them with giant grins on our faces. I’ve seen more dolphins and whales in my life than I could possibly begin to count (thanks to growing up on the South-East Coast of Australia) but I still get beside myself when I see them! 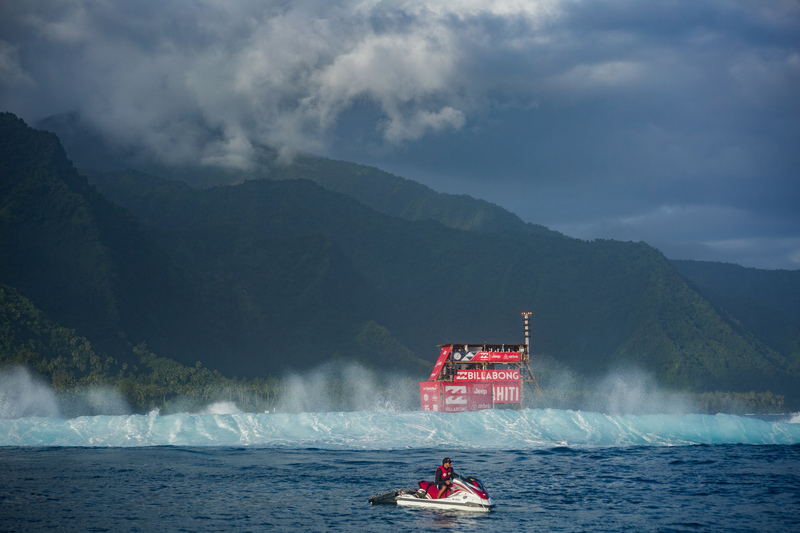 After cruising with the dolphins, we finally made it to the channel, and found ourselves amongst a sea of boats; some big, some small, all vying for a view of one of the world’s most famous surfing competitions – the Billabong Pro Tahiti. As our speedboat nudged its way closer to the action, Scott got the okay to jump into the water with his underwater camera housing. As I watched Scott paddle towards the action, I noticed one of my favourite Aussie surfers, Mick Fanning, chilling on his board in the water as he watched the competition unfold before him. It wasn’t his heat, but many of the surfers would sit at the edge, watching the competition and cheering each other on, which was great to see! The fun couldn’t last forever, especially considering that the boats had to go back into shore every hour to drop people off and pick the next lot up. We still had about fifteen minutes to go, but our boat driver got into an argument with the Jetski patrol. At least, I’m pretty sure it was an argument… I don’t speak French very well but it certainly didn’t sound like they were inviting our driver over for a beer after the event. Anyway, we had to head back in to shore a little bit earlier than expected, but it was plenty of time for Scott to get some incredible shots from the water! After returning to the shore, Scott and I wandered down to the little village to grab some lunch. We found a spot to sit on the black sand beach, and watched the little local kids catching waves close by the shore. Obviously, the waves were nothing near as big as the ones further out on the reef, but we were still super impressed by the kiddie surfers. Some looked no older than four years old, absolutely killing it – I think we were definitely watching the future generation of world surfing champs! Still feeling a bit jet-lagged from our journey the day before, we decided to head back to our bungalow to recharge. Vanira Lodge (where you should absolutely stay if you visit Teahupo’o) is built on the side of the mountain, meaning it offered stunning views of the Pacific Ocean from just about anywhere on the grounds. We settled in with our books, enjoying the view while we recharged in the sunshine. The sun setting on one of the coolest days of my life! A couple of hours later, we decided it was time to get back down to the Billabong Pro, so off we went back down to the end of the road. We managed to get on the last boat heading out to the channel for the afternoon, and arrived just as the final heat was beginning. As I watched the heat, I couldn’t help but look back towards Tahiti, where the afternoon sun was casting a golden glow over the island. It looked so epic; the sunshine really brought out the deep green of the mountains. It was one of those ‘pinch me’ moments, where you really can’t believe you’re doing what you’re doing, or you’re in a place you never thought you’d ever be. When the announcement that final heat of the day was over came over the loudspeaker from the judge’s station, a stampede of local surfers jumped into the water and paddled furiously to the break, hoping to catch a sunset wave. Scott followed closely behind them, primed with his camera gear, still riding on the high from shooting the wave earlier that morning. 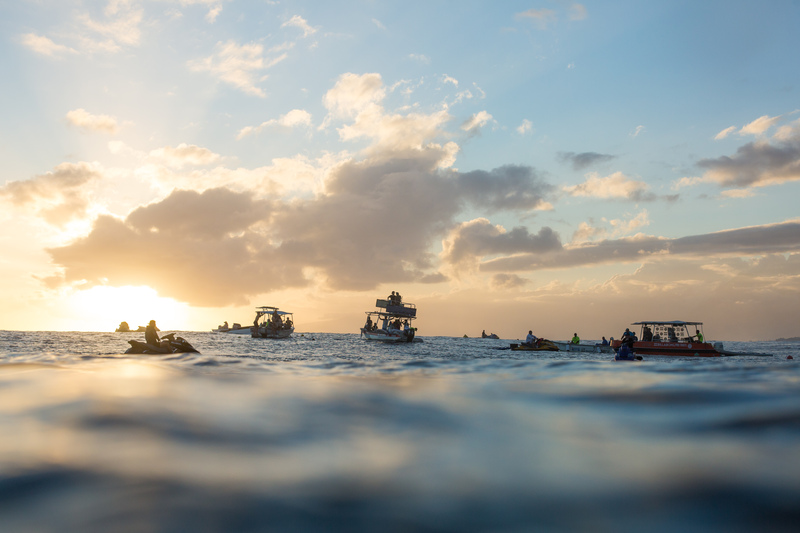 Here are some of Scott’s amazing snaps from the weekend at Teahupo’o. If you’re interested in purchasing any of the below images as a print (and you should be), please visit www.scottruzzene.com!